I talked about a Thrity Umrigar book a few days back and today I am back, to rave about her book Bombay Time. Some of you might know why this book is so special to me. I am a Mumbaikar and devour any book which mentions my city and it’s beauty. Umrigar puts my city in the title. How could I resist this book? This time she chronicles the life of Parsi families of Wadia Baug.It has multiple story lines where we get to meet a host of characters of various natures who form this seemingly close knit affluent community. Each one has a story hidden somewhere which more or less explains their individual out look towards life. She uses marriage as a tool to bring these people together and takes us through their lives and gives us a glimpse into Parsi customs and their lifestyle . Each time a character is depicted ,Mumbai or the then Bombay is shown in the background. The changes the city has gone through having accommodated and adjusted while bringing about some good and bad changes in the outlook of its oldest settled communities is done so well that I felt I was watching this happen rather than reading it. While reading this book , Jimmy Kanga , Coomi Bilimoria , Tehmi , Dosa Popat and most importantly Rusi were not just mere characters on the pages of a book , they each talked and I am sure every person who has read this book felt the same way. I could call it a set of short stories but then they are all connected . Umrigar ties knot in a way only she can. The prose was absolutely beautiful. No two thoughts about that.Any body who enjoys contemporary fiction will love this book. There is a bit of vernacular used but that I thought added to the charm of story telling.I haven’t let out the story to you because the beauty lies in the discovery . You will enjoy it more if you don’t know before hand what each one of these characters has to tell you. A poignant , emotional story told in a way that is simply beautiful. 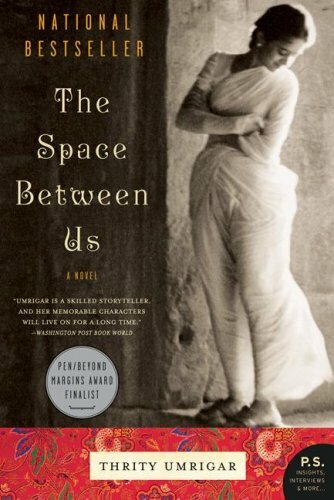 Thrity Umrigar ‘s The Space Between Us was one book at the end of which I was left speechless , not because of any ground shattering discovery or any revealed mystery but for the honesty with which it was told. Two women bonded by friendship and divided by social standards makes a wonderful story. Sera , the Parsi woman who lives a life many would envy has a side of her life that is filled with domestic violence and pain she can hardly speak about. Bheema on the other hand , a servant in Sera’s house has always had a life she wished she never lived to see. One filled with poverty and pain.The sharp contrast in their social standing is equaled only by the similarities they share on a emotional level.Life goes on until Maya , Bheema’s unmarried granddaughter becomes pregnant shattering Bheema’s hopes and dreams . In trying to solve Maya’s problem , many things get distorted and life will never be the same for them again. This was my first Thrity Umrigar book and I was mesmerized by the narration. She knows how to make a reader want to read a book and not leave it. There are lots of issues which this book deals with like caste discrimination , domestic violence, poverty, alcoholism , gender bias .All dealt with tact and sensitivity. P.S. – I wanted to review this a long time back but due to some reason it never happened, until today when I saw my copy of the book and re read whole of it and also remembered that if I have to get back to blogging let it be with a book I can recommend to all my blogger buddies. South Asian Author Challenge is being hosted by Swapna at S.Krishna’s Books. This challenge is to encourage people to read books by South Asian Authors – South Asia being India, Pakistan, Bangladesh, and Sri Lanka. The books can be from any time period, contemporary or classic. I am really very excited about this challenge. Thanks to Swapna , now can reduce quite a few books from my TBR pile and read those authors whose books I have piled up but haven’t had a chance to read.